Sitting barefoot on the beach, tapping away on your laptop, sipping a margarita, watching the sun set…and watching your bank account run dry as you pursue this false representation of what it means to be a freelance anything – writer, graphic designer, website designer, marketing consultant, or my favorite, freelance copywriter. If you’re used to my normal upbeat, hopeful, and inspiring posts, you might want to skip this one and the next. Yes, I’m delving into the dark side to expose the “freelance” hucksters who are selling you a pipe dream. Today I’m going to talk about 11 things they’re not telling you about the freelance life. Not to worry, though. I’ll also give you 11 Big Ideas in my next post to help you overcome this dark side of freelancing. It’s all the basis of my upcoming book, Death of a Freelancer: 11 Big Ideas to Overcome the Dark Side of Freelancing. This will give you a sneak preview, and before I jump in, just one more thing. You can do whatever you want with the terms “freelancer” and “freelancing,” but I for one am burying them. And everywhere you look there’s a Freelance Institution, Association, or Club. The idea of a having a J.O.B. and “working for the man” has been so vilified that the pendulum has swung the opposite way, glorifying the idea of being a freelancer. You know what I’m doing here in the Copywriter Café? I’m “Turning Big Ideas and Copywriting Skills into Profitable Businesses” (my tagline). In other words, I want to help you build your own business as an Independent Creative, rather than being a freelancer for hire. Yes, it’s semantics, but it’s also positioning that will take you much further, and help you build true wealth for yourself, not just for your clients. 1. You won’t make six figures in your first year. In fact, you’ll be hard-pressed to make six figures in your first three years. 2. There’s a good chance you’ll have negative cash flow your first year or two. Yes, negative cash flow. No one talks about this because it’s embarrassing. It will take a little while to get your business up and running, and during this time you’ll have both living expenses and business expenses that could very well add up to more than your freelance income. No benefits, no paid vacation, no insurance, no 401k, no boss (yes, that can be a major problem for many freelancers), and nowhere to go on any given day, which leads to a loss of a sense of purpose. 4. Labeling yourself a freelancer means you’ve become a commodity. Freelance copywriters, graphic designers, artists, and writers are a dime a dozen. You have to do much more to distinguish yourself and command the proper fees (details in Death of a Freelancer, part 2). Think you’re only going to work 3-4 hours a day, then head to the beach like my freelance poster girl above? Think again. If you don’t put in 50-hour weeks (or more) your first few years, your competition will. It’s a dog-eat-dog (or freelancer-eat-freelancer) world, and there’s no lack of new, hungry entrepreneurial types champing at the bit to make their mark. 6. Talent and proven work trumps programs and certifications. Clients don’t care where you learned your skills or what associations you belong to. They want to see what you can do for them. 7. Clients don’t respect the term “freelancer” as much as before. As more and more freelancers have flooded the market and hung out their shingle, aided by sites like Elance.com and Guru.com (legitimate sites, by the way), it’s cheapened the word “freelancer,” which means you have to do more to separate yourself from the pack. 8. It’s easy to spend a lot of money on programs and conferences put on by people who are not freelancers themselves. It’s even easier to get sucked into the trap of buying “just one more program” that will give you the key to making it big. When that doesn’t work, you’ll buy another. I know, I’ve done it myself (and I’ve also found some true gems – again, stay tuned for part 2). In other words, you have a few mega-success stories, each revealing their “secret sauce.” The problem comes when hundreds, or even thousands, follow this one-size-fits-all advice, and after a while everyone starts to look and sound the same. 10. A-level copywriters will hire you at B-level (or worse) rates because their time is better spent running their business than writing copy. You will be a cog in their machine, a pawn in their chess game, helping their business become very successful while you go from one freelance project to another, never building any true wealth yourself. 11. The laws of supply and demand don’t skip over the freelance world. I spent four years of my life (four and a half, to be exact) getting a degree in Economics from the University of Wisconsin. I don’t remember most of what I learned, but I can tell you this: when there’s a greater supply of something (freelancers) than demand, prices (fees) go down. In spite of everything I just wrote, which I’ve either experienced myself or witnessed first-hand while working closely with freelance copywriters the past five years, I wouldn’t trade what I do for the world. My life is immeasurably better because I chose to be a copywriter. I spend more time with my wife and kids, I make good money, and I travel the world, bringing my work with me. But…you have to do things differently. The lights have gone out on the old freelance model. A new day has dawned, and it’s a bright future for those who embrace the new Independent Creative model. Stay tuned for Part 2, where I give you 11 Big Ideas to overcome this dark side of freelancing, and triumph. Are you with me? I’d love to hear your thoughts so far. Give me some quick feedback here. Steve, being new to the copywriting world, I don’t feel “qualified” to say a lot. However, my gut tells me that you are “write” on with where you are leading us, and I’m definitely on board! Thanks! I feel like I know you already and we’ve yet to meet. Soon, right? Let’s get that Chat scheduled. Great shades of Willy Loman! Pithy and to the point. To own one’s own copywriting business, one must realize: this is a BUSINESS, not a vacation. Looking forward to Part II, and to the book release! Yeah, not a very subtle nod to ol’ Willy, was it? Self-discipline – that really is the key. You’ve hit it, Sue. Kind of goes against the norm in society these days. Want to start a self-discipline revolution with me? Awesome truth-telling, Steve. I couldn’t agree more with this post. Burned at the stake or tarred and feathered, Don. Good thing I’m a fast runner. I’m glad the notes are resonating with you and quite a few others. Wow, Steve – you’ve really blown the lid off of the whole freelancer illusion here…and I’m so glad you have! I think the majority of us have fallen for any or all of those 11 fallacies and think, “I’m never going to make it.” And a lot of us give up (I did for almost eight years). But establishing your business, as you have mentioned here and elsewhere, is the main key to creating a lucrative writing career. It took me a long time to realize that, but now I’m well on my way. I know you’re well on your way, Janice, because I’m watching your upward trajectory! You have been laying the foundation for a couple years. Now it’s time to capitalize on all your work. Sweet. The first email I read when I wake up tells me I should get up and be different! Fine then! I’m up! And I think I’m going to enjoy what’s coming and gain a lot from being part of your community. Thanks for your guidance and for telling it like it is and… raw. I already experienced some of what you mentioned. Comments like yours get me fired up, Rhonda! Thank you. We’re creating something special, and it sounds like you’re already on your way. Press on. Thank you for the honesty of this post! 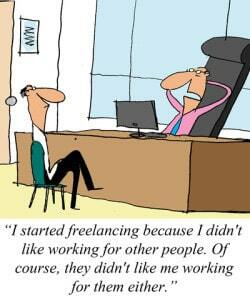 Even though I have been freelance writing for the past 8 years off and on. And just getting into copywriting and totally agree with everything you said. However, I would not give it up for a minute and I’m looking forward to growing my business! You’re welcome, Patricia. I feel the same way – no matter how hard it can get, I wouldn’t trade this for the world. It’s in my heart and soul. I look forward to watching your business grow! Let me know if I can help in any way. Hi Steven – pretty much everything you’ve said here is something I’ve suspected all along! I’ve been a member of AWAI since buying their basic copywriting program a few years ago. While I have learned from the program and their online information, I knew that it couldn’t be that easy right out of the gate. It’s actually refreshing to read your article and learn that, while it’s not an easy breezy process, a copywriting career is possible! I look forward to learning even more through Copywriter Cafe. Thanks for being honest, and for sharing your experiences and knowledge with us. You’re welcome, Connie. Just calling ’em like I see ’em! I see a Brand Renaissance in the making here, a new approach to creating an independent lifestyle of abundance. Thanks for being a part of this community, too. Hope we cross paths in person at some point. I really enjoyed this. A lot of hard hitting, but valuable information. I’m in my last semester of college and looking what to do when I graduate. Freelancing is in the running , but everyone is telling me it’s not possible where I live. So I have apr. 3 months to decide. I can’t wait to see the Part 2 of your article..
Linnet, I think it most definitely IS a viable option, IF you do things differently than most people. Location doesn’t matter. You could put me in the middle of Death Valley and my cup would overflow. Let me know if I can help in any way. You have that ability of dropping the bomb when unexpected, but long needed, Steve. I have been reading and practicing a lot of “being present” (when someone talks to you, and even when your brain talks to you) and “looking at things from another balcony”, and your words fall in the cracks of those shuttered thoughts. Francesca, thank you for your comments. I’m glad I’m striking a nerve. By the way, I love your colorful writing style! “Dropping the bomb when unexpected,” “looking at things from another balcony,” “your words fall in the cracks of those shuttered thoughts” – wow! Have you written a novel, or thought about it? Put me on your list when you do. I’ve done it all – been a subcontractor, bid on projects, posted profiles on countless sites, networked, and basically done whatever was within my means to market myself. The clients I get do love my work. They refer people, and I have a number of “regulars.” (BTW, I am a technical writer and CPRW.) I’m not quite sure what that all means, because the way I learned it copywriting is a form of technical writing. Anyway, it’s been established. I do good work. My problem is not getting the traffic like many writers. You mentioned certifications, etc. are meaningless, and I couldn’t agree more. After not finding work for way too long, I went back to school in 2005. You know we are competing with recent UW grads, half our age (at least mine) who will work for pittance, and look prettier in the Christmas picture. I earned my degree with a very high GPA, had 6 letters of recommendation from former professors and one employer, and then earned the CPRW. I, like every other idiot thought a degree was my ticket to endless job offers. I’m in no better shape than the day before I started school, other than owing $100K in student loans! I can relate to ever point you made. One other thing, which at times drives me crazy is the solitude. Sure, we’re interacting with people from all over the world, in some cases, but not having the camaraderie of being around other people, going out for that Friday night drink, and the company picnic, can really drive you nuts after a while. Anyway, before my comment is as long as your article, I will just say thanks for putting it into words! Thanks, Genise. I’m honored by your comments. The thing those recent UW grads (and even people in their late 20s and 30s) don’t have is life experience. That’s what people our age need to sell, and I think we also are better communicators in general than the generation coming up. They’ve been groomed on email and texting, not so much on real, in-person communication. What I’m saying is, we have to go with our strengths and play against our competition’s “weaknesses.” Whatever it takes, right? I get what you’re saying about solitude, too. This is a lonely endeavor. It’s one of the reason I created the Cafe, which isn’t a substitute, but it helps. I’m also big on getting small groups of people together (like at my retreats) and meeting with people one-on-one. Speaking of, let’s grab coffee sometime! I’m at the point in my life where I have the kind of wisdom and knowledge that only people can get by living and experiencing life for a certain amount of years!! I found something you may find interesting. I hope this works. Interesting post, Genise. I just posted something yesterday on Facebook about Jerry Seinfeld being more proud of an article he wrote about a new Porsche for Automobile Magazine than anything else he’s done. Hi, Steve, I’ve been so busy this year — with trying to get to a level of “better” than years before that I haven’t been keeping up with your Copywriter Cafe blogs and posts. Really enjoying what you have to say a lot. Good stuff! Keep up the good work. I’ll be clicking in and reading more. Thanks much! Welcome back from Ecuador! To a great fall, winter, year — and a great Vermont Retreat! I too want to start traveling more. (; But not quite there yet. Thanks, Katherine! Great to see you back. Look forward to connecting again. I just wanted to thank you Steve for keeping me inspired. I haven’t been keeping up with your blogs or in the Cafe like usually, but this post was great. I woke up today with a new attitude, and got back to the grind. New ideas came rushing in last night. Created a plausible goals list, and started the work day out, by dropping “freelance” from all my business profiles. Thanks again for all the tips and hoping to making it to a retreat in 2015. Glad to hear it, Troy. Sometimes all it takes is a quick hit of reading something to generate some new ideas. And I’d love to have you come to a retreat in 2015!